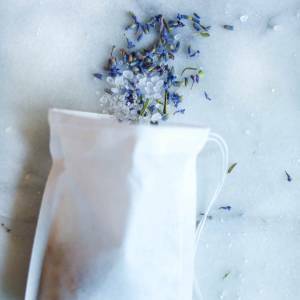 Make a large batch of these Lavender Bath Soak Tea Bags and keep them handy for when you need a relaxing bath or give them as gifts! Carefully open an empty tea bag and add epsom salts, lavender flowers, and coconut oil capsules. Carefully pull the strings to close. Store in an airtight bag until ready to use. Here are links to the products you’ll need!